CLC Knee Boot, SZ 10, Black, Red Bar Tread Outsole, Plain Toe, Slip On Closure, Fabric Lining, Rubber, Resists: Water, Fit Over Sock, For Concrete, Mud and Water Upper material: Suede leather. Primary color: Beige. Outside sole: Rubber. Construction: Goodyear Welt. Inside lining: Light and soft Cambrell fabric. Upper material: Suede leather. Primary color: Beige. Outside sole: Rubber. Construction: Goodyear Welt. Inside lining: Light and soft Cambrell fabric. Upper material: Suede leather. Primary color: Beige. Outside sole: Rubber. Construction: Goodyear Welt. Inside lining: Light and soft Cambrell fabric. Upper material: Suede leather. Primary color: Beige. Outside sole: Rubber. Construction: Goodyear Welt. Inside lining: Light and soft Cambrell fabric. Upper material: Action leather. Primary color: Black. Outside sole: Rubber. Construction: Goodyear Welt. Inside lining: Light and soft Cambrell fabric. Steel toe. Fifteen inch; 100% waterproof PVC boot; resistant to many chemicals; outsole designed for long wear and traction; FOOT FORM contour insole for comfort; reinforced at critical stress points. Color: Olive Green. Fifteen inch; 100% waterproof PVC boot; resistant to many chemicals; outsole designed for long wear and traction; FOOT FORM contour insole for comfort; reinforced at critical stress points. Color: Olive Green. Goodyear welt construction stitched soles provide maximum strength and durability. Rubber outsole provides superior oil and slip resistance. Inside lining composed of light and soft fabric for added comfort. Meets ASTM F2413-05 Standards. Wide width allows for extra foot room. Contoured fiber footbed with steel shank insert for shock absorption and comfortable support. Padded leather tongue and collar for superior comfort. Steel toe for ultimate protection. Goodyear welt construction stitched soles provide maximum strength and durability. Rubber outsole provides superior oil and slip resistance. Inside lining composed of light and soft fabric for added comfort. Meets ASTM F2413-05 Standards. Wide width allows for extra foot room. Contoured fiber footbed with steel shank insert for shock absorption and comfortable support. Padded leather tongue and collar for superior comfort. Steel toe for ultimate protection. Goodyear welt construction stitched soles provide maximum strength and durability. Rubber outsole provides superior oil and slip resistance. Inside lining composed of light and soft fabric for added comfort. Meets ASTM F2413-05 Standards. Wide width allows for extra foot room. Contoured fiber footbed with steel shank insert for shock absorption and comfortable support. Padded leather tongue and collar for superior comfort. Steel toe for ultimate protection. 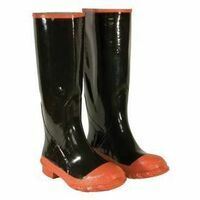 Fifteen inch; 100% waterproof PVC boot; resistant to many chemicals; outsole designed for long wear and traction; FOOT FORM contour insole for comfort; reinforced at critical stress points. Color: Olive Green. 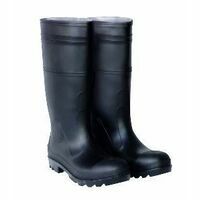 Fifteen inch; 100% waterproof PVC boot; resistant to many chemicals; outsole designed for long wear and traction; FOOT FORM contour insole for comfort; reinforced at critical stress points. Color: Olive Green. Goodyear welt construction stitched soles provide maximum strength and durability. Rubber outsole provides superior oil and slip resistance. Inside lining composed of light and soft fabric for added comfort. Meets ASTM F2413-05 Standards. Wide width allows for extra foot room. Contoured fiber footbed with steel shank insert for shock absorption and comfortable support. Padded leather tongue and collar for superior comfort. Steel toe for ultimate protection. Goodyear welt construction stitched soles provide maximum strength and durability. Rubber outsole provides superior oil and slip resistance. Inside lining composed of light and soft fabric for added comfort. Meets ASTM F2413-05 Standards. Wide width allows for extra foot room. Contoured fiber footbed with steel shank insert for shock absorption and comfortable support. Padded leather tongue and collar for superior comfort. Steel toe for ultimate protection. Goodyear welt construction stitched soles provide maximum strength and durability. Rubber outsole provides superior oil and slip resistance. Inside lining composed of light and soft fabric for added comfort. Meets ASTM F2413-05 Standards. Wide width allows for extra foot room. Contoured fiber footbed with steel shank insert for shock absorption and comfortable support. Padded leather tongue and collar for superior comfort. Steel toe for ultimate protection. Designed to give you stable footing and lots of coverage. 100 percent waterproof. Made of rubber/neoprene. Color: Black. Designed to give you stable footing and lots of coverage. 100 percent waterproof. Made of rubber/neoprene. Color: Black. 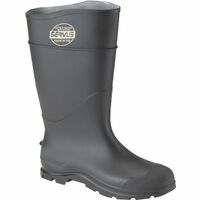 Fifteen inch; weather ready boots with durable outer sole. Gripping power for traction and stability. 100 percent waterproof. Keeps your feet comfortable, warm and dry. For hiking, hunting, walking or riding. Color: Mossy Oak Break Up. Fifteen inch; weather ready boots with durable outer sole. Gripping power for traction and stability. 100 percent waterproof. Keeps your feet comfortable, warm and dry. For hiking, hunting, walking or riding. Color: Mossy Oak Break Up. Fifteen inch; weather ready boots with durable outer sole. Gripping power for traction and stability. 100 percent waterproof. Keeps your feet comfortable, warm and dry. For hiking, hunting, walking or riding. Color: Mossy Oak Break Up.